Packed with 939 state-of-the-art effects offering a huge variety of dark cineastic atmospheres, noises, sweeps, amazing LFO madness, ground-shaking impacts / explosions, percussive & processed stuff, a huge collection of oneshots (tonal & non tonal) and 300+ cutting edge kick free fx loops (127 & 140 bpm) never heard before – everything royalty free. The wide range of SOR FX Revolution Vol.1 provides ready to use material to the club-/dance- producer, which still leaves enough free space for own creativity. This multi format sample pack is not only suitable to ennoble Minimal, Electro and House productions, but can also perfectly be adopted for commercials, dubbing of movies and computer games as well as for web-design. Loop-Detail: These loops encompass the whole frequency spectrum and contain loop variations for the perfect song climax. Another classic added to our collection! This is a great sample library with loads of new and fresh fx sounds. Not just to use, but to be inspired by! I´ve been a fan of SOR´s products in the past. Oliver Schmitt continually finds ways to raise the bar for sound design. If you´re looking for inspiration and reeeeeally brandnew fx samples/loops, SOR is the only ticket. This material is delicately put together and is brilliant for adding polish to productions. It saves us a lot of time with the details in so we can concentrate on being creative musically in the studio. The sample packs and soundsets of “Sounds of Revolution” are a MUST have for any producer looking for quality production material. They totally hit my creativity spot and I already have my favorite sounds and loops after just skipping through the libraries a few minutes. These will find their way into my productions for sure! FX Revolution is the second samples pack from German producer Oliver Schmitt, whose Club Revolution Vol.1 gained an MTM Excellence award back in issue 69 (our verdict on the release read ‘An essential toolkit for anyone writing electronic music’). This time around, however, he’s turned his attention to synth effects, creating a massive library of dark atmospheres, ear piercing noises, sweeps and LFO madness. This multiformat DVD contains 1.14gb of 24bit WAV audio along with corresponding sampler patches for EXS and Kontakt. The 300+ kick-free FX loop samples also come in Apple Loop and REX2 formats, offering additional and welcome flexibility. The thin, cut-up vocals, raspy noise rhythms and glitchy filtered hi-hat grooves have all been designed to compliment your main beat, much like the loops in Oliver’s previous samples pack. The bulk of the library covers atmospheric sounds, impacts and one-shots, sweeps, backwards whooshes, a folder of extreme LFO based effects and various other heavily processed noises. The evocative atmospherics selection has a cavernous feel and the subtle detail makes it excellent for film soundtrack work or ambient intros. The sweeps are complex and multi-layered, often combining moving white noise with rising synth lines. It’s a more-than-minor miracle that Oliver has been able to create in excess of 120 synth sweeps that actually sound different from each other. //VERDICT// The deepest and most complete Synth FX library we’ve ever heard. hen we reviewed Oliver Schmitt’s most recent sample collection, Club Revolution, we were seriously impressed with its Techno sounds and he’s delivered the goods again this time, with over three hundred loops at 127 and 140bpm and nearly a thousand FX hits. […] Wie man es von SOUNDS OF REVOLUTION gewohnt ist, sind die einzelnen Sounds übersichtlich in Gruppen unterteilt so das man schnell findet was man sucht. […] Mir fällt auf das die Sounds exterm klar und rauschfrei sind. […] Die Apple Loops lassen sich problemlos einbinden und bestehen auch größeren Tempowecheln. […] Mit FX Revolution Vol.1 setzt Oliver Schmitt hohe Maßstäbe. Gerne würde ich diese Formatvielfalt auch von anderen Herstellern sehen. FXR1 ist eine Ergänzungslibrary für Electro-, House- und Dance Produzenten auf hohem klanglichen Niveau. Ihre wahre Stärke liegt aber in der Vielzahl inspirierender Klänge, die sich gleichermaßen fürs Sound-Design als auch das Vertonen von Filmen oder Computerspielen eignen. […] Klanglich wird eine Menge geboten, von sanft und weich bis sägend-aggressiv mit viel Distortion und Ringmodulation. […] Alles wirkt betont elektronisch und synthetisch, ist gut sortiert und schnell auffindbar. Die Formatvielfalt tut ihr übriges und hält nun vielleicht dauerhaft Einzug bei Mutekki. “…Dieses Sample Pack sticht ein wenig aus der Reihe der anderen hervor. Zielen die bisher erschienenen Titel klar auf die Riege der Dancefloor Produzenten und/oder Live-Künstler ab, spricht diese DVD durchaus auch Produzenten anderer Genres an. Nicht nur im Filmbereich, sondern auch im Bereich der Werbung und der Computerspiele werden FX Sounds immer wieder benötigt. […] Für mich sind auch die Loops mehr als nur ein Bonus: Sie sind einfallsreich und wie immer State-of-the-Art! Und vor allem: Nicht unnötig lang geloopt, nur um auf viele Megabytes zu kommen. Beide Packs (wie auch alle anderen SOR-Produkte) sind an den Bedürfnissen von Producern ausgerichtet, mit denen der Sounddesigner Oliver Schmitt in regem Kontakt steht. Dort kommt es weniger darauf an, einen komplett durchgestylten, möglicherweise auch noch mit Hall versehenen Beat, geliefert zu bekommen – ganz im Gegenteil: gefragt ist eigenständiges Material ohne Bass Drum und Snare, da vor allem diese beiden Schlaginstrumente Stil und Klang eines Grooves beinahe unveränderlich festlegen. Viel flexibler kann man arbeiten, wenn diese beiden prägenden Akteure fehlen. Und auch was den Sound betrifft, sind im Producer-Bereich frisierte und bis ins letzte aufpolierte Sounds weniger gefragt. Hier schätzt man ebenfalls den Freiraum der nachträglichen Gestaltung. Dabei hat der Sound etwas Puristisches, und wenn zuvor davon die Rede war, dass eigene Kreativität bei diesen bis ins Detail bestens vorgefertigten Loops nicht zwingend gefordert wird, so gilt dies nicht für die Klanggestaltung. Hier lohnt es sich, mit Kompressoren, EQs bzw. Filtern und auch mit Reverbs einzugreifen, was – wie eingangs dargestellt – ganz im Sinne des Erfinders ist. FX Vol. 1 ist ein breit angelegtes Kompendium an Effektsounds aller Art. Auch Vocal-Schnipsel, Geräuschhaftes, Percussives und eine Vielzahl von rhythmischen FX-Loops laden zu abendfüllenden Entdeckungsreisen ein. Die LFO-Variationen sind eine echte Bereicherung. Mit 79,99 Euro ist dieses Paket ein Preisbrecher, ohne dass man soundmäßig Kompromisse eingehen müsste. Last issue, when I reviewed Kick Free Revolution Vol. 1 & 2 from Sounds of Revolution, I gave both libraries high marks for their excellent quality. Lots of good dance sounds, I remember. In this sample pack, however, SOR’s Oliver Schmitt unveils himself as a diverse sound designer by serving modern FX samples for use in electronic and dance genre. 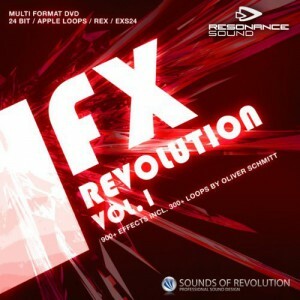 Although Sounds of Revolution is known worldwide to make techno, house and dance loops, FX Revolution Vol. 1 is as equally impressive as his other releases. Included in this pack are odd noises, nice filtered sweeps, twisted LFO sounds, hard-hitting impacts & explosions, futuristic percussive sounds and a massive set of one-shots for building your own custom drum kits. I explored the 900+ samples by auditioning them in Sound Forge 9. I find that the sounds are carefully crafted and edited with the use of clever processing. What impressed me are the good selections of impact and explosion sounds, even the additional 300+ kick-free loops rock.